The 2016 Cash Game Festival London at Aspers Casino Westfield Stratford City was a huge success. The first-ever Cash Game Festival in the United Kingdom was a huge success, with players from around the world competing at low and high stakes for 120 straight hours over five days from March 30 to April 3 at Aspers Casino Westfield Stratford City in East London. Over the weekend, there was barely an empty seat in the poker room when at peak times there were 28 tables of players at stakes ranging from £1/£1 to £25/£50. The action kicked off on March 30 with players showing up in huge numbers for mid-week action. There over 20 tables enjoying a variety of games including no-limit hold'em, dealer's choice, pot-limit Omaha, six-plus hold'em, and open-face Chinese poker. Among some of the bigger names competing on the same table over the weekend were 2014 World Series of Poker Main Event runner-up Felix Stephensen, Finland's Mikko Petteri Turtiainen, and Sweden's Leo "ISILDRooN" Nordin. Although Stephensen is from Norway, he didn't need to travel far for the games because he lives in London. He shared he learned about the Cash Game Festival from friends and wanted to get in on the action. Two of the biggest pots took place on Friday and Saturday on the £25/£50 no-limit hold'em tables. A hand late on Friday witnessed Spain's Javier Perez Estevez taking down a huge pot of over £20,000 when his held against Andrew Paul Baar holding the and David Pedro Lega with the after the trio agreed to run it twice when getting all the money in preflop. On Saturday, an almost equally big pot of £18,000 was taken in by Romania's Vasile Cosmin Stancu after flopping a set with the in a pot already bloated to £3,800 after four-betting took place preflop against Matthew Moss, who held . While the 2016 Cash Game Festival London did attract many big names, the festival was more about the everyday player being able to compete on a big stage and have fun. Live streaming took place each day of the festival on the Cash Games Festival Twitch channel with the action always kicking off with a £1/£1 or £1/£2 match. To add to the fun, organizers included a special dinner at a Brazilian restaurant and a table-tennis tournament. The table-tennis tournament was a lot of fun for the many players who decided to take a break from playing poker to enjoy a few drinks and compete in a different venue. The excitement was capped when Sweden's Michael Renato Graucob defeated Estonia's Maret Komarova in three sets in a very competitive match. Graucob, who shared with us he enjoys playing a game that is little known outside of Norway called Sviten Special when at home, said he had a blast at the festival despite not coming out a winner on the poker felts. "Winning the ping-pong title in itself it is a win!" stated Graucob. "It was one of the greatest things I have done so far. Hopefully I will keep winning them and maybe even next time I will win money playing poker." Komarova, a tennis instructor and former collegian athlete had better luck on the felts and also enjoyed the table-tennis battles. "It was so good," shared Komarova about the table-tennis competition. "Tough and fun battles both during both the semi-finals against Andreas and the finals against Michael. Both matches went to a third and deciding set." Former child chess prodigy Jeff Sarwer was also among those having fun throughout the poker festival commenting that what he truly enjoyed was the unique spread of many types of poker variants. Sarwer "In general introducing new games is always a good idea, and these are good games with lot's of action," shared Sarwer. Marketing and Gaming Consultant Warren Lush was on hand each of the five days of the poker festival and believed that not only is the Cash Game Festival good for players, but for poker operators as well. "Where I think it is very good for the operator, is compared to a festival of tournaments, an operator makes more money off cash games," commented Lush. "So, it makes business sense. In other words, I believe the idea behind the Cash Game Festival is excellent." 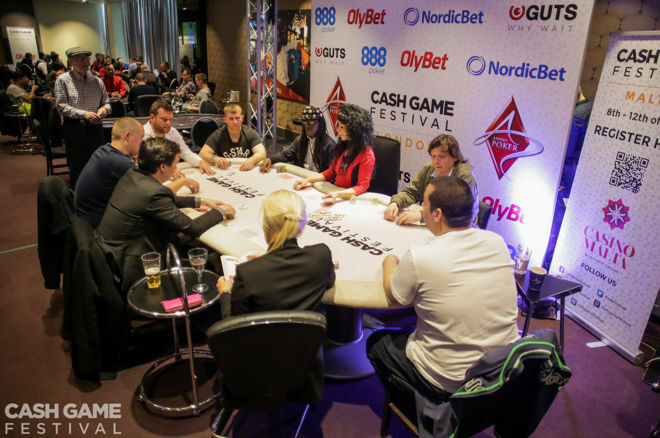 Festival organizers also agreed the first ever Cash Game Festival in the UK was a success. Cash Game Festival co-founder Martin "Franke" von Zweigbergk commented during the festival that the atmosphere was "Amazing!" before adding that, "I am very very happy." Von Zweigbergk also was pleased with the fact that the festival has proven successful after its inaugural run in Tallinn, Estonia showed promise to the poker world commenting, "How should I say it? We are now global with the Cash Game Festivals at Aspers!" Aspers Casino Westfield Stratford City Head of Poker John Scanlon also was pleased with the festival sharing when the action was picking up on Friday that ""It's been very good today. Different action today with a lot more Omaha with many different players coming in which is good." On the heals of the success in London, the next Cash Game Festival will take place in Malta from June 8-12.